Quinoa is an ancient super-nutrient food that is gaining attention in the healthy diet menu. 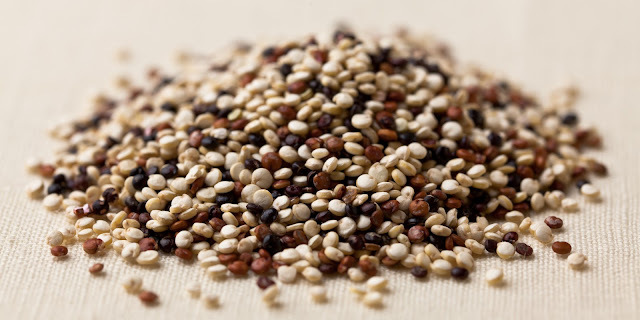 Quinoa, a gluten-free and quality protein-rich food, is an annual psuedo-grain of the goosefoot species (Chenopodium). This grain was very important in the diets of the Incas of South America over 5,000 years ago. The Incas considered quinoa to be sacred (1) and named it “Chisaya Mama” (mother of all grains). Quinoa remains an important staple today for the descendants of the Incas. Consequently, quinoa is widely consumed in Peru, Bolivia, Chile and other South American countries that are largely occupied by the descendants of the Incas. Quinoa has a protein content of 13.8% (dry weight). Quinoa is one of the very few plant-based sources of quality proteins. The human body breaks down the exogenous proteins to their amino acid components which are then used to build human proteins. Availability of quality proteins (availability of the essential amino acids) from dietary sources is necessary for the body to complete the synthesis of proteins and maintain functional integrity. Quinoa has all of the essential amino acids, and it has them in proper and adequate amounts and proportions for utilization by the human body. The essential amino acid composition of quinoa is shown below (1). The high level of lysine and the adequate level of tryptophan in the quinoa grain are worthy of note. Lysine is a limiting essential amino acid in the corn, wheat and rice, whereas, tryptophan is a limiting essential amino acid in the legumes. A limiting amino acid is an amino acids that is in low concentration, making it the determinant of the rate of protein synthesis. In the presence of a limiting amino acid, the body may not be able to synthesize all of the needed proteins. Minerals are very important for maintaining the functional integrity of the body. In the absence of minerals, life on earth would be impossible. We can generally obtain the primary minerals (sodium, potassium, calcium, phosphate, etc) from our diets, but the trace minerals are not readily available in our diets compared to the primary minerals. Some foods, such as the mushrooms , are replete with trace minerals. Most plant sources do not have adequate amounts of trace minerals. Among the plant based-sources of nutrients, quinoa stands out as one of the foods with significant amounts of trace minerals. Magnesium, phosphate and trace minerals in significant amount in the quinoa grain are shown below (2). The values are shown as milligrams (mg) of the mineral in 42.5 grams (.25 cup, one serving) of quinoa. The percentage of The daily recommended value of each mineral as a percentage in one serving of quinoa (% DV) is also shown. Both the leaves and seeds of quinoa are edible. Quinoa belongs to the same family as the spinach, so the vitamin content of the leaves would show some resemblance to that of the spinach. Our attention, however, is focused mainly on the grain. Vitamins are found in significant amounts in the quinoa grain, however, the types of vitamin are not as broad as that of the typical leafy vegetable. Presented below are vitamins found in significant amounts in the quinoa grain . Quinoa for Better Health Quinoa supplied high quality proteins for the Incas, and supported them through the Inca's Civilization. This super-nutrient grain, sometimes called the “Incas Gold”, has now found its way to our healthy diet menu. Only time will tell if this ancient super-nutrient grain can help to improve our health and sustain us as it did to the Incas 5,000 years ago.